Visa 23BHD has holding tank labels reversed! If your 23BHD has stickers placed like the picture shown below, they are labeled wrong. The sewage/blackwater tank & valve is on the left and the gray water/wastewater tank & valve is on the right. Re: Visa 23BHD has holding tank labels reversed! 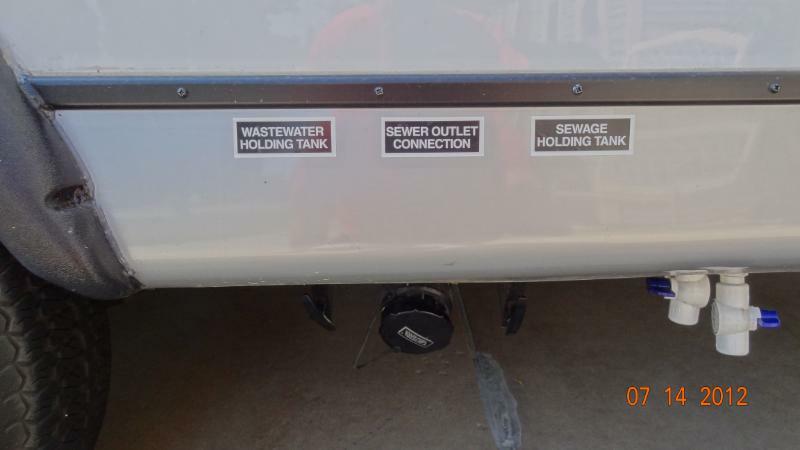 We have a 2012 23ft RBK and the tanks are also labled wrong but this is a very small concern considering the problems we have had with the camper. What other problems have you had Marvin? And for the record, our stickers are on right - left black, right gray. Our 19â€™ Visa ERD had the labels reversed also. Our 19RGU has black on right and grey on left labelled, and drains out as such. Maybe there is different plumbing setups that require different labelling on the outside. I thought mine were reversed too. I couldn't believe that the gray water tank was in front of the sewage tank given the center location of the potty. But I was wrong the labels are correct. I know because I put a rinsing wand down the potty hole and ran the water. I needed to be sure so I could install a quickie flush kit. Done! Just a note - the labels are reversed on our Visa 19ERD. At least the diameter of the pipes and valves are correct - large one on the black water and small one on the grey water.